October 27th is close enough, in our opinion, to throw a Halloween party. For your delight, we’ll have a veritable clown car of comics from the North East for you including Nick Banks, Fran Garrity, and Carl Gillespie. But, just for good measure, we’ve got Les Kershaw from Salford on the bill as well. Come in costume and get in for free (also free with student card). As it’s our Halloween special we’ll be amping up our free candy supply, of course. If you like costumes, comedy and/or sugar highs, get thee to this gig! 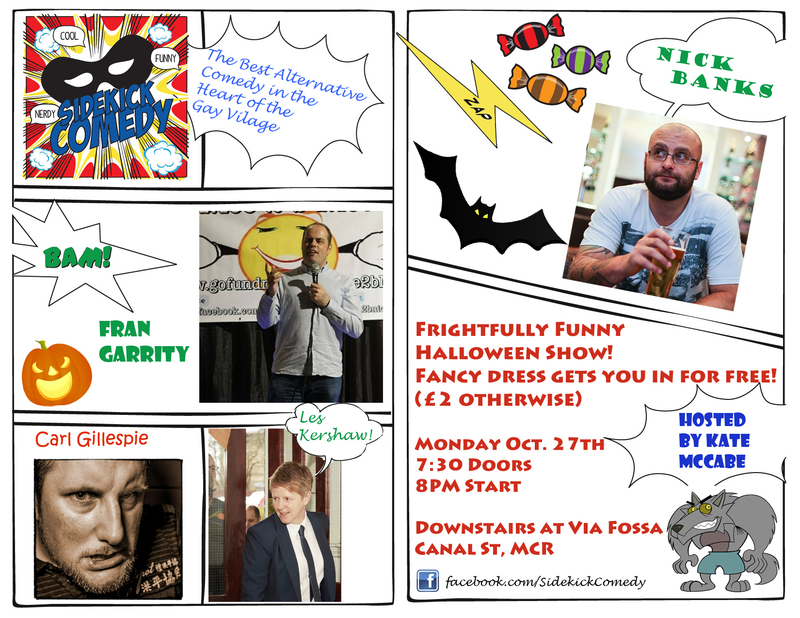 This entry was tagged Carl Gillespie, Fran Garrity, Halloween Party, Les Kershaw, Manchester Comedy, Nick Banks, Stand-up. Bookmark the permalink.